The studio that created hits like “Frozen” and “Wreck-It Ralph” now brings us “Big Hero 6”, a futuristic tale based on the eponymous comic book series. As with the two prior titles, Disney Animation Studios hits one out of the park; “Big Hero 6” is easily the best animated film of the year – so good that my husband, who NEVER wants to see a movie more than once in the theater, has already asked when we can go again. The story opens in the future megacity of San Fransokyo, where boy genius Hiro (Ryan Potter) is being bailed out of a dicey situation by his equally bright older brother, Tadashi (Daniel Henney). Hiro is clearly squandering his talent as a grifter on the underground robot fighting scene, and Tadashi offers him another potential future, one where Hiro features prominently as a fellow student at San Fransokyo Institute of Technology (SFIT). Part of the sell: Tadashi introduces him to Baymax, his personal healthcare robot whose advanced intelligence dazzles Hiro and convinces him to create a project for a showcase to help him audition for the same collegiate program as Tadashi. Adorable level on a scale of 1-10? Clearly an 11. Hiro’s work is brilliant: astonishing microbots that move, swarm, and flow according to neuron impulses captured by a special headband. His microbots win the day, and Hiro garners the competing attentions of SFIT program head Professor Robert Callaghan (James Cromwell) and dubiously-moraled entrepreneur Alastair Krei (Disney Animation regular Alan Tudyk). Krei offers a wide-open purse, but Callaghan’s disdain for Krei gives Hiro pause, so he chooses to take the college program instead. While celebrating outside the SFIT building with Tadashi and his program-mates/friends, a fire breaks out inside and one person dashing away in terror informs them that Professor Callaghan is still inside. Hiro pleads with Tadashi not to go back in, but Tadashi insists that someone has to do something – and both he and Callaghan are lost. Mourning consumes Hiro, so much so that when he accidentally hurts himself and Baymax comes out of his holding case to render care, Hiro immediately dismisses him and barely notices when a tossed off command to chase an errant, anomalous microbot sends Baymax through the winding streets of San Fransokyo. Hiro follows – only to find that someone is manufacturing his microbots, which had all been assumed lost in the fire. That someone turns out to be a mysterious character in a Kabuki mask who controls a plentiful supply of microbots and attempts to snuff out Hiro and Baymax with his creations. Hiro enlists the help of Tadashi’s friends and provides “upgrades” to all of them, tech uniquely designed to optimize their strengths and skill sets, such as Go Go’s roller suit that capitalizes on her magnetic disc designs. The six-member team – Hiro, Baymax (now in a special winged armor), Go Go (Jamie Chung), Honey Lemon (Genesis Rodrigues), Wasabi (Damon Wayans, Jr.), and Fred (T.J. Miller) – track down the Kabuki-masked person, in an attempt to understand what happened the night of the fire. Their reconnaissance and the subsequent chase show the level of Hiro’s emotional wounds from the loss of his brother, and the team has to find a whole new way to rally in order to dispense justice and bring Hiro back from the brink. “Big Hero 6” is a mature kids’ movie, or perhaps it’s better to describe it as a shinier, computer-generated piece of anime. The characters are engaging, the story is well-written, and Baymax is one of the best things to hit the screen in ages. He’s a marshmallow of a robot, simultaneously soft and firm, and his unwavering support for Hiro is – at times – heartbreaking. I saw this movie in 3D, and though I’m sure it looks great in 2D, it was visually stunning in 3D. If you’re asking whether you should watch “Big Hero 6” in 3D, I’d recommend it but not say that it’s an absolute requirement. And now, the other big question: is “Big Hero 6” scary? I brought the entire family to this movie, somewhat unsure how the Kabuki-masked figure might be for my 5 and (then) 7 year-old. I showed both kids two trailers for the movie, and while my 7yo dd was still a thumbs-up, my 5yo ds was ready to bolt. We brought him anyway, and they had the usual standing order to snuggle up with one of us if they got scared. My ds did fine throughout the movie, even adopting Baymax’s signature fistbump (“ba la la la la!”), while his big sister cringed for good bits of the movie and has tried to ban any discussion of it. In other words, your mileage may vary. There are a couple of scary scenes, but the movie is generally bloodless and each of the brief scary scenes are well outweighed by a far larger number of amusing or uplifting scenes. It’s a testament to how great this film was that dh can’t wait to go again – and I knew instantly that this is one that we’ll buy on release day when it makes it to Blu-Ray/DVD. 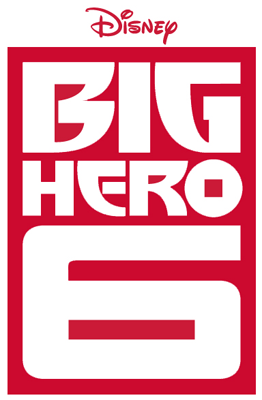 In short: don’t miss “Big Hero 6”. Speaking of shorts: “Big Hero 6” is preceded by a sweet short film called “Feast”, about a puppy who grows up to be the gourmand wingman for a bachelor with a penchant for fast-food. As his owner and BFF develops a romantic relationship with a woman who teaches him to love vegetables, the (now-grown) dog is relegated to more of a pet role. Life happens and the couple separates, leaving things up to the dog – much like the paper airplanes of Oscar-winning “Paperman” – to make the happy ending happen. This delightful and sweet romp made for a great lead-in to “Big Hero 6”, and I wouldn’t be surprised if either one garners an Oscar nomination of its own. “Big Hero 6” opens nationwide on November 7, 2014. This movie is rated PG for action and peril, some rude humor, and thematic elements. This entry was posted in movie reviews and tagged baymax, big hero 6, feast, movie reviews by crunchymetromom. Bookmark the permalink. Great review. I loved Big Hero 6 🙂 and was surprised, I didn’t know ti was going to be that good.